I designed the Handy Apron shortly after opening the workroom. At the time, I was the only one working in the shop and often found myself trying to find my one tape measure or remember where my pair of scissors was. I decided to take a crack at creating my own utility apron that could double as a gardening apron or just a generally handy apron with pockets and loops. I’ve made a few of these and love wearing them. All the little pockets are great to stash all kinds of things you might want to have quick access to. 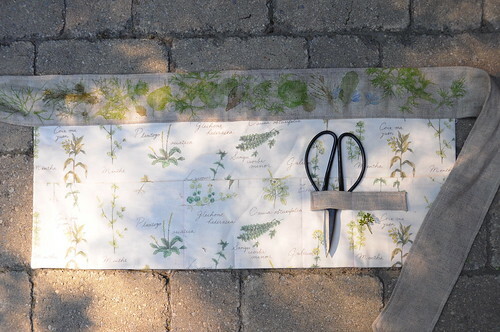 When I saw this French botanical fabric (the writing is in French, but the fabric is Japanese), I knew I needed to make myself a gardening apron. I used contrasting fabrics for the first time, choosing a plain linen for the ties and for the tool loops. 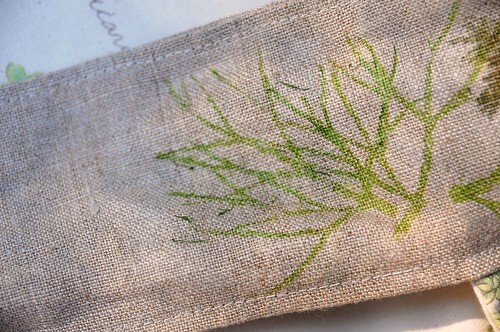 When the apron was finished, I thought it would be fun to add some texture to the natural linen. During the India Flint workshop, India talked about a technique she would often do called hapa-zome. 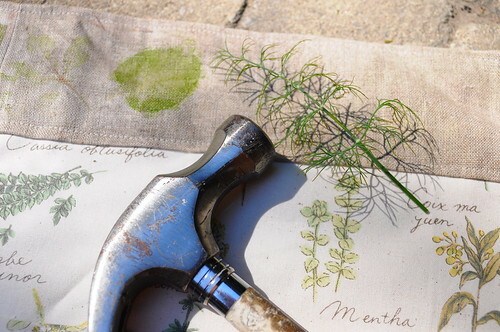 Essentially, you hammer or smash plant material (leaves or flowers) into fabric to create an imprint. I really wanted to try this simple technique out. I snipped some leaves from the garden and set about smashing them into the linen ties. Some things worked better than others, but I was amazed at the clarity of the images this technique left behind. When reading up on other people’s experiences with hapa-zome on the internet, I found that most people would layer the plant material in between two pieces of fabric before smashing. I used a metal hammer and carefully tapped directly onto the leaves that lay on my fabric, which was laid out on top of a piece of template plastic on top of patio stones. This is an incredibly satisfying process, as you can imagine. 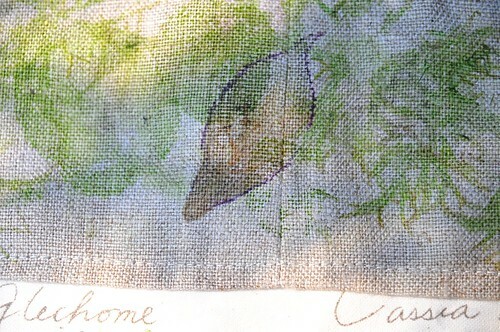 To set the imprints, I just used my iron to steam the fabric. I’ve also read about using salt water to set the prints. To test the fastness, I threw the apron in the washer and dryer. There was a bit fading. I think it was mostly all the smashed plant material being washed away, but I quite like the faded look. This method is not super permanent, but apparently it can be extended by pre-mordanting the fabric and also by waiting as long as possible before washing it. One note. I used organic cotton canvas as a sew-in interfacing inside the apron. This is something I’ve been using as a substitute for interfacing in my bags and other projects. I didn’t pre-wash the canvas before using it and it shrunk a fair amount when I washed the apron. I ended up taking part of the apron apart to adjust for the shrinkage. I hadn’t run into this problem before, since I don’t usually wash my bags. I will pre-wash the cotton canvas going forward, just in case. I love your apron (and the hapa-zome – I’m going to have to try that). Did you write up this pattern for purchase at THe Workroom? It would be a perfect present for my sister the gardener (who was saying the other day that she really needs a little apron with good pockets for working around the house). that is SO COOL karyn! I really LOVE that apron! looks fantastic!! 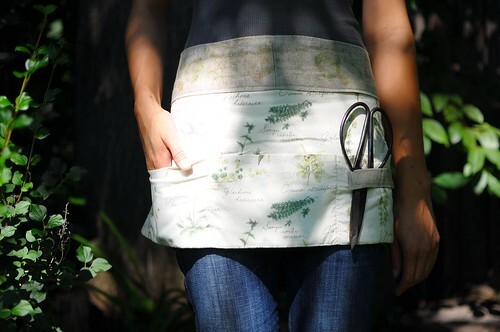 LOVE the idea of smashing plant material into fabric – the apron is awesome! love the apron and the print is just beautiful! That is an awesome apron! I love the hapa-zome technique, I will definitely need to try that sometime soon. karyn this is so beautiful! i love the fabric and the imprints! I love this, Karyn! Also, it seems like a great project for frustrating days: smashing things (even lightly) could be especially therapeutic, and you’re left with something pretty at the end. Wow, what a great technique, I love it! I just found and love your site – I’m starting to read through all the back entries – so many wonderful projects! Thank you for the inspiration! this is the best apron style I’ve seen around. I hope to take this class soon! Okay, this project just rocks my world, Karyn! SO cool! I love it! That is such a great technique & I love the apron .